It is an aquarium. It is an artwork. It is an aquarium. It is an artwork. It is an aquarium inside an artwork. It is an artwork inside an artwork. It is a “creation” in the true sense of the word. Pierre Huyghe’s aquariums in Hauser & Wirth (13 September – 1 November 2014, London) are live ecosystems enclosed by the artist in glass cubes. He behaves almighty. 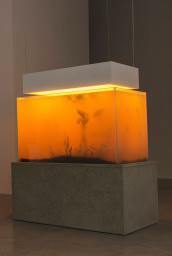 Huyghe has installed aquariums, among other places, at the Marian Goodman Gallery in New York in 2011 and more recently, in 2013, at the Centre Pompidou, Paris. Since 2005, he has been interested in biology and organism self-development, like in 2008, when he transformed, for a 24-hour period, the Sydney Opera House into a fog-filled arboretum, or in 2010, when he planted a calendar’s worth of flora in Madrid’s Crystal Palace for Reina Sofia, representing different seasons and holidays throughout the year and then letting them battle for ground rights. He stood out in dOCUMENTA XIII (Kassel, 2012), remarking his interest with “presence”, composing in a park an installation that included a real painted dog, a beehive-headed sculpture (with bees, of course), marijuana and poisonous fruits, left to their destiny without any control. The biotopes of IN. BORDER. DEEP at Hauser & Wirth, despite their life-independence, have a narrative within. They have been, in fact, transplanted from Monet’s ponds in his garden in Giverny, the one represented in his famous “Nymphéas” paintings. Fabulously, Huyghe’s research went deep into the origin of his living organisms, so that the lighting sequence in the vitrines is programmed according to the variations of the weather in Giverny (speeded and alternated) during the shortest day in 1914, the autumn of 1917 and the entire period from 1914 and 1918, when Monet was there. The audience is witness of events suspended in time. Are the ecosystems mirrors of the past or are they developing in an uncertain future? The artist said: “In these situations there is no script, the animals do not play an emotion. Still it is a constructed condition. Each entity has being chosen according to its specific natural behaviour, the “biosemiotic” that could recall a part or certain form of archetype specific to a given emotion or a situation we have encountered. Together, through their natural relation in this context it allowed to build an equivalence of this emotion”. A video shows a collection of recordings of insects set in amber since the beginning of times: a frozen moment, a contingency, a memory of life and micro-representation of those independent, extremely well-organised living societies that insects build. The sense of the primordial that all these creations recall and the idea of archaeological research that they include, are combined in The Clearing, a site-specific work represented by a sanded portion of wall that reveals another colour that has previously been painted over. 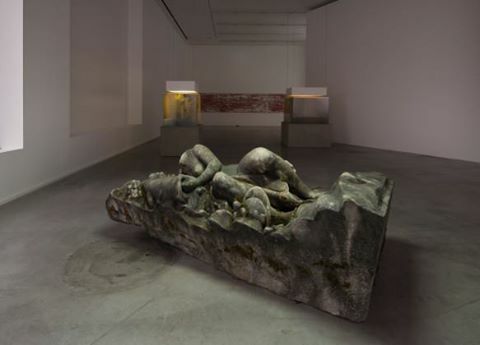 Huyghe looked for the geological formation of the wall, as the wall was a living artefact that participates into the continuous transformations of the gallery in relation with the different exhibitions. Life is also protagonist of the headless human sculpture La déraison (“The Unreason”). The sculpture itself has not been made by the artists, but it is a concrete cast for a monument originally created for an exhibition in 1931. Huyghe’s intervention lies in the insertion of a heating device that roughly stands for the human circulatory system, stimulating the growth of moss, similarly to what happened in the beehive-piece created for dOCUMENTA XIII. This is what the artist is mostly interested in and his main power: forms that take their way independently from the moment of their creation, that would not be exhausted by a sedimentation of discourses. The region of a habitat associated with a particular ecological community. Allard van Hoorn, ‘Pierre Huyghe: the moment of suspension’, Domus, 18th October 2011.